On its phenomenal journey of continuously maintaining the highest standards of beauty, quality and excellence, Rocell was recently bestowed with a remarkable honour by being named one of the Top 20 Best Sri Lankan Brands for 2017, at the inaugural Interbrand Best Sri Lankan Brands awards ceremony. Interbrand is regarded as the world’s largest and most influential brand consultancy. Their rankings, which identify the most valuable Sri Lankan brands, is modelled on Interbrand’s prestigious annual Best Global Brands report, the definitive guide to the world’s 100 most valuable brands. The Best Brands list is Interbrand’s compilation of brand tables that valuate the world’s top country brands based on three key components that contribute to a brand’s cumulative value - financial performance of the branded products and services, the role the brand plays in influencing customer choice and the strength the brand has in order to command a premium price or secure earnings for the company. “This is the pinnacle of achievement in the sphere of branding and business, and I am proud to say that we have been recognised by the most prestigious global branding consultancy in the world. For a relatively new brand, Rocell has demonstrated that it is a brand of global standards. 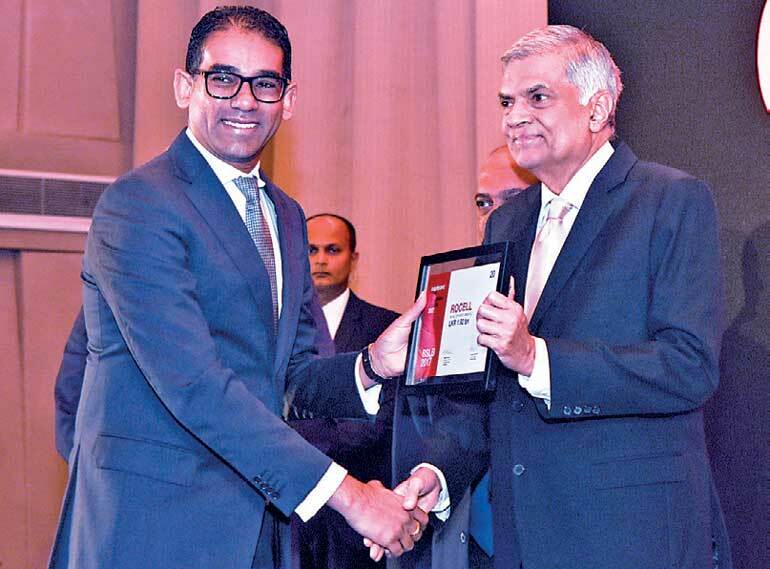 We have overtaken other stalwarts in the local industry to secure a position amongst the top 20, and we are the only brand from the Construction, Building Material and Homeware sector,” stated RCL Marketing and Business Development Director Tharana Thoradeniya. Rocell has relentlessly focused on achieving the highest levels of design excellence while creating world-renowned business and branding standards. Starting off as a tile and sanitary ware brand, in a few short years Rocell rapidly evolved into one of the most sought after lifestyle brands that inspires elegant living by being at the forefront of fashion, world-class design, innovation and integrity, all complemented by unmatched quality. Supported by the expertise of renowned Italian designers, Rocell products are designed to world-class standards and manufactured in the company’s two state-of-the-art manufacturing facilities in Sri Lanka. With its unwavering commitment to maintaining the highest standards of quality, the brand has surpassed the boundaries of excellence and gone on to receive international certification. Every bathware product, accessory and tile manufactured by Rocell is an aesthetic masterpiece that lends exquisite possibilities to interiors, making the brand a trendsetter in the world of architecture and interior design because of its sheer integrity, innovation, design and matchless quality. Today, Rocell glows on its mantel of success - the unequivocal symbol of beauty and excellence that effortlessly inspires breathtaking new ideas and creates lifestyles that reflect refined taste and exquisite elegance.